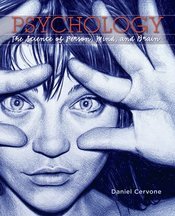 In Psychology: The Science of Person, Mind, and Brain, experienced teacher, researcher, and author Daniel Cervone provides students with a new and exciting way of understanding psychology. Cervone organizes material around three levels of analysis -- person, mind, and brain -- and employs a person-first format that consistently introduces topics at the person level: theory and research on the lives of people in sociocultural contexts. Students are able to make sense of the latest research through what they understand best: people. With fellow teacher and researcher Tracy Caldwell, Cervone has conceived a text beyond the print experience from the ground up, integrating online immersive research experiences and assessment tools that capitalize on research findings on pedagogy and student learning (e.g., the testing effect). Working closely with Daniel Cervone, fellow teacher and researcher Tracy Caldwell of Dominican University developed the book’s pedagogical program from the Preview Questions at the beginning of each section to the Self-Tests at the end of each chapter. The pedagogy is designed to engage students at multiple levels of Bloom’s taxonomy and at multiple points in each chapter.